Following the successful launch of our sixth book, ‘Sheloria Stokey and the Halloween Acorns’, we are well and truly beginning to get excited for some festive fun! 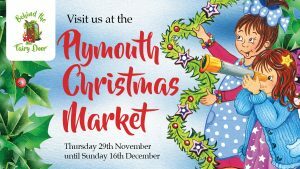 We are delighted to announce that for the first time we will be participating in the Plymouth Christmas Market 2018! Having been invited to join in with the celebrations, we can confirm that we will be in attendance from Thursday 29th November until Sunday 16th December. 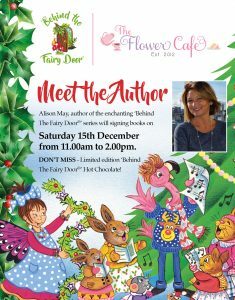 We are also thrilled to announce our exclusive festive event on Saturday 15th December at The Flower Cafe, Plymouth where our author, Alison May, will be signing books. The famous hot chocolates which Shelly and her team are known for, will be extended to a limited edition to incorporate ‘Behind The Fairy Door’. Not only will they be pretty, they will taste delicious!! So Christmas jumpers at the ready!! The six books, including ‘River Dawn and the Christmas Stockings’ are available along with DT himself in our website shop! Have a browse for some Christmas ideas! Previous post: Signing, Signing and Signed! Next post: The festive season is well & truly all around us!